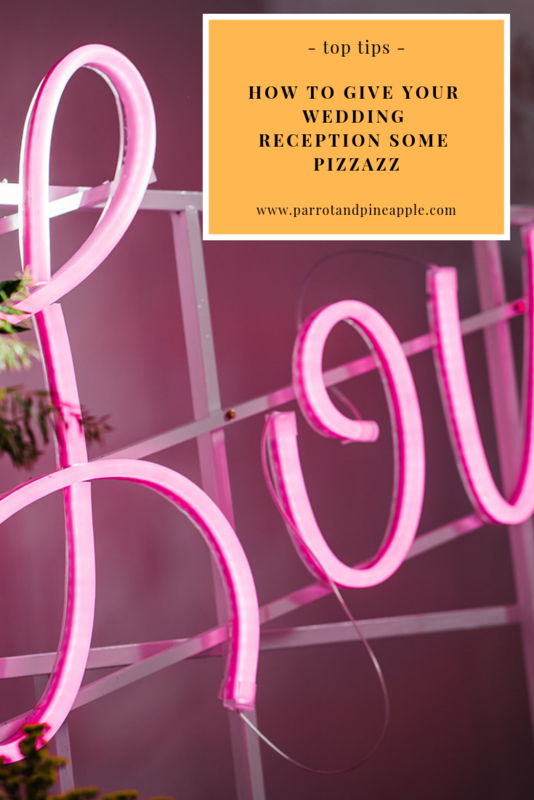 At Parrot & Pineapple, I’m all about the party and the pizzazz – and not just because they begin with a p, either (although that does help). 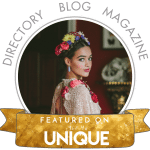 If you’re looking to have a fun, unconventional wedding that reflects your personalities, your reception is a perfect opportunity to unleash some majorly quirky wedding ideas to blow your guests’ minds. First off, Caroline says staying true to yourself is super important. “YOU DO YOU! 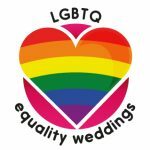 I have to admit that whilst our own wedding was totally out there and very us-” (her and husband Stuart created their own spinning teacups for theirs) “-there were still a couple of elements I didn’t incorporate because I thought they didn’t fit the theme. Of course, now I wish I had done them anyway! Lesson learned…anything goes if the theme is YOU TWO!” This almost guarantees some funny and quirky wedding ideas off the bat! Another easy way of giving your wedding reception some serious pizzazz is with a big rental. 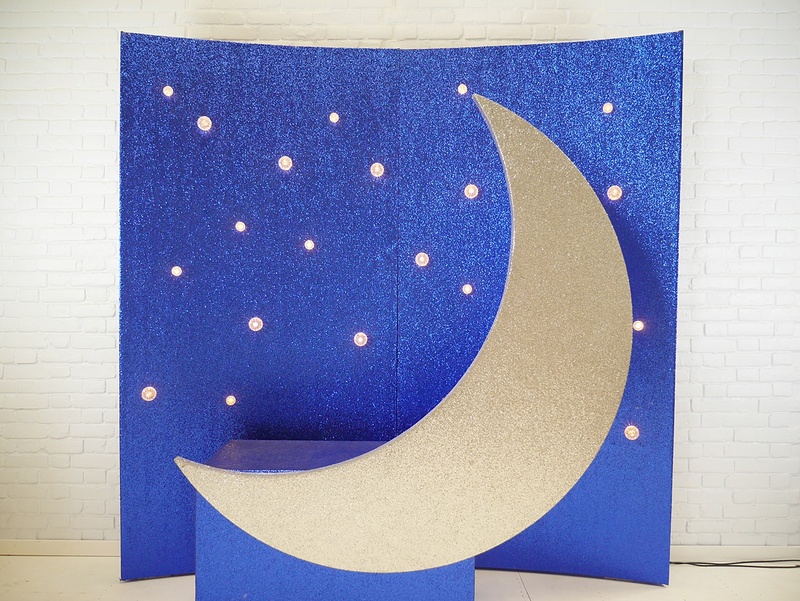 It can be tempting to buy lots and lots of tiny decorations for your reception, but often fewer, bigger elements have more impact. Whether your venue is a blank space you’re trying to personalise or it’s somewhere with characteristics you’re trying to disguise, big rentals can act as a focal piece that totally transform the room and the mood. 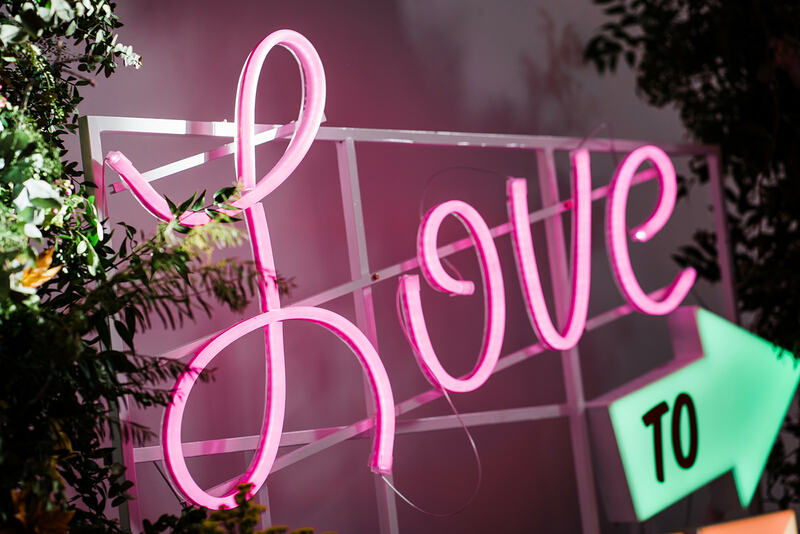 A great example is a giant light-up sign, but I don’t mean just any sign – after all, we are talking about the creators of a giant neon wedding rainbow! 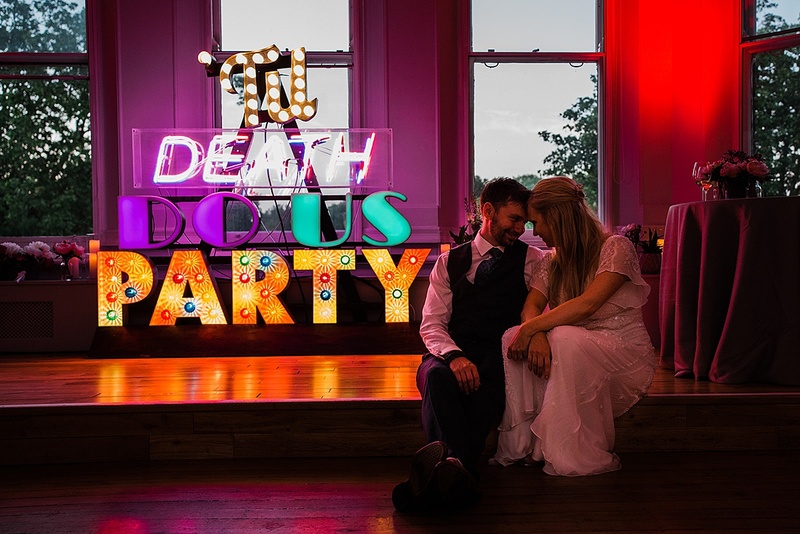 “I think my favourite piece of ours is still our ’Til Death Do Us Party sign. 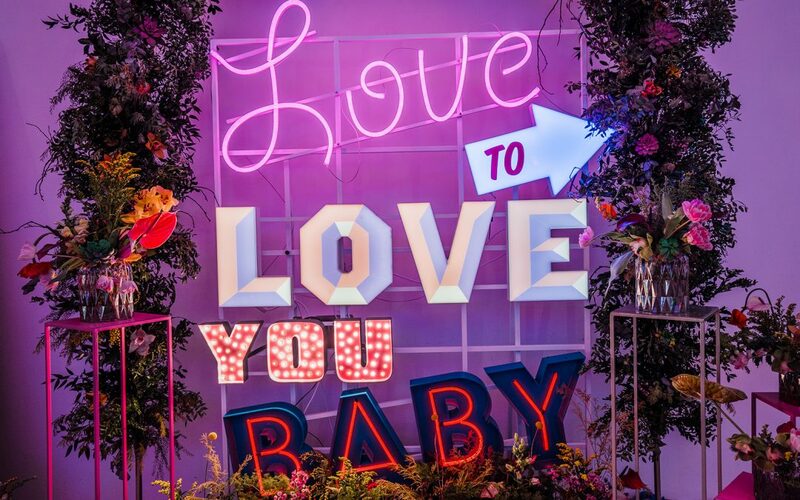 It incorporates lots of different mediums, including bulbs, neon and light boxes, so it’s a real show stopper.” Caroline says. 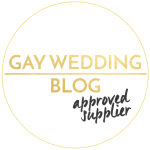 Plus, this is double the fun as it’ll be a total shock to your guests – so if you’re looking for some wedding surprise inspiration, this is it! So, let’s get this party started folk! How are you putting pizzazz into your wedding reception? 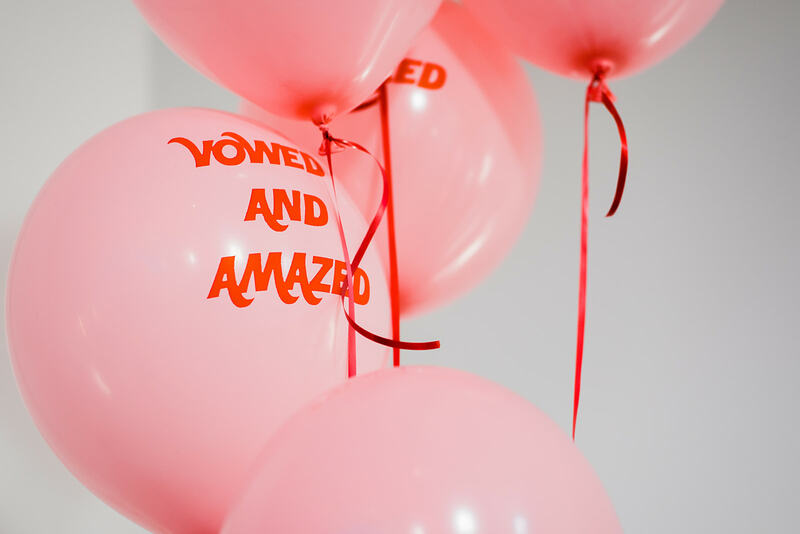 For more unconventional wedding ideas check out Vowed & Amazed’s wonderful website here: www.vowedandamazed.co.uk/, and hop over to Pinterest to see what else I’m loving. Found this super useful? 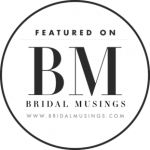 Why not pin it to your own wedding planning boards? Brill! Go right ahead. You can also follow me on Pinterest too for more inspiration.